If you are adding a new furry little girl to your home, perhaps one of the female dog names listed below will help you name your new canine companion. If you're looking for a clever name with a touch more personality than you see at the local dog park, check out these unusual categories. The idea is to choose a name that will make your dog stand out from the pack. Siria: This feminine Spanish name refers to Sirius, also known as the "dog star." Adolphina: This name means "noble she-wolf." Kira: This name means "sunny" and is perfect for a yellow lab or golden retriever. Malika: An Arabic name, Malika means "queen" or "ruler who is female." Enora: A French and Irish name, Enora means "honor." Lovette: Lovette is an ancient name that means "girl like a wolf cub." Ciara: This Irish name means "dark," ideal for a beautiful dark-colored dog. Selena: A Russian name, Selena means "moon," perfect for a dog descended from wolves. Melisande: This exotic dog name means "animal strength," ideal for a large, powerful breed. Madigan: This Irish name means "little dog." Disney provides us with some great name choices for your dog, especially if you like cute and sometimes elegant monikers. These are especially great if you happen to have children or grandchildren who will certainly recognize these characters. 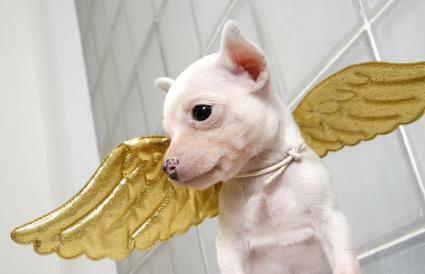 Tinkerbell: What a perfect name for a small dog like a Maltese or a Chihuahua. Pocahontas: This is a great name for the girl that likes to explore! Minnie: Of course, this is for Mickey Mouse's girlfriend, but it also makes a great name for any tiny female dog. Jasmine: How can you ever go wrong with a princess name? Beauty: Could this be the perfect name for your little beast? Fantasia: This isn't an actual character, but it still makes a lovely name for a female dog. Ariel: If you have a girl that just can't resist a good swim, this is the perfect name for her. 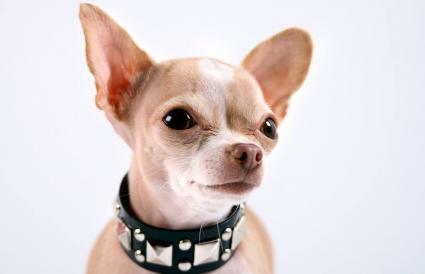 Wendy: Named for Peter Pan's companion, Wendy suits any dog that is loving and well behaved. 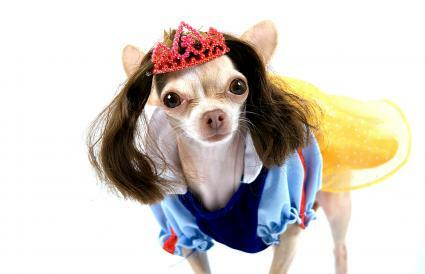 Snow White: This is another terrific name for any white dog, especially a Maltese. Perdita: This is a lovely name for a Dalmatian. Cinderella: This name is very elegant, and a bit of a mouthful to boot. You can shorten it to Cindy or Ella for a nickname. Bambi: This name conjures up images of big brown eyes and considerable cuteness. Try it on a Shih Tzu or Pug. Lady: Who can forget Lady and the Tramp? Belle: This names goes along with the "beauty is the beast" theme. The names of certain flowers are as lovely as the blooms they represent, and some flowers carry special meanings. Try out the following names on your own female. Lily: This name is both graceful and cute. Rose: A perfect name for the cute little nipper in your life! 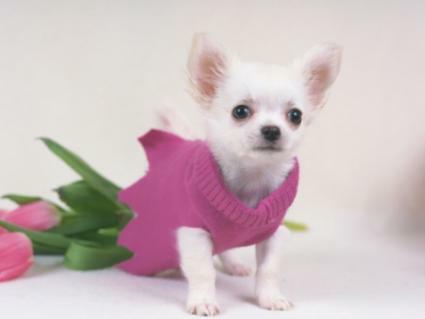 Petunia: This is an adorable name for the roly-poly puppy girl. Tulip: This could be a wonderful name for a puppy born in spring. Ivy: This is a good name for a dog that never wants to be separated from you. Freesia: Sweet smelling a colorful, the name Freesia has a lovely ring to it. Honeysuckle: Reserve this name for the dog with the sweetest disposition. Orchid: This makes an especially great name for a rare breed. Pansy: Another good name for a dog with a sweet and demure personality. Posey: Slang for a flower, Posey still makes a very cute name. Names in this category are rarely used as female dog names, so if you're looking for something out of the ordinary, try one of these. Calypso: The name of a sea nymph, try this name with any dog that loves the water. Aphrodite: This names belonged to the Greek goddess of love. Artemis: This name comes from the Greek goddess of the moon. If your female loves to howl by the light of the moon, consider this name. Cassandra: This was the name of a Greek prophetess. If you have a dog that barks even before it's obvious someone is at the door, this might be the name for her. Electra: This is the name of a Greek princess, but it conjures feelings of electricity and excitement. It's a good name for that slightly energetic and excitable dog. Juno: Juno may have been the wife of the Roman god Jupiter, but the 2007 movie of the same name has made this a very popular name indeed. Hera: Known primarily as the jealous wife of Zeus, you can have a little fun with the spelling of this name and change it to "Haira." Calliope: This name comes from the muse of poetry. You can shorten it to Callie for a nickname. Athena: This was the goddess of wisdom, and it makes a good name for any dog that learns quickly. Aia: A Japanese name, Aia means "she who rules." Ajita: This Indian name means "invincible" or "unable to be conquered." Alexandra: This Russian name means "protector" and is perfect for a female dog who guards her family home. Yadviga: Another powerful Russian name, Yadviga means "warrior." Audrey: This classic name actually means "noble strength." Valencia: A Spanish name, Valencia means "strong and brave." Hilda: This German name means "warrior." Geashna: A Hindu name, Geashna means "female champion." Roxanne: This name means "dawn," but the nickname, "Roxy," has a powerful feel. What kind of personality does your female dog have? Is she sweet or sassy? Bold or demure? Personality is definitely something to consider when you're choosing wonderful pet names. No matter which type of name you choose for your dog, remember you are uniquely qualified to choose. After all, you know your canine companion better than anyone.